Explore in detail the unique prototypes presented by Kia and Nissan at the Geneva Motor Show 2019. From exterior, interior and infotainment. Every year, motor enthusiasts around the world gather at Switzerland’s celebrated Geneva Motor Show to talk all-things-cars! Manufacturers are given the opportunity to showcase their latest upgrades and inventions giving attendees an exclusive look into what’s to come. From enhancements in exterior styling to completely new designs, from redesigned interior suites to the unveiling of smart technology and brand-new infotainment systems, the Geneva Motor Show provides a sense of passion and pride amongst petrolheads at the same time feeding our automotive cravings. It’s always refreshingly exciting to see just how far some manufacturers will go and each year boundaries are pushed out further and further, especially when it comes to the all favourite: concept cars. 2019’s Geneva Motor Show played host to all sorts of crazy concept cars and prototypes but today we’ll be paying particular attention to the ways Kia and Nissan took us back to the future! One of the most talked about concept cars at the show this year was the appropriately named ‘Imagine’ by Korean brand Kia. 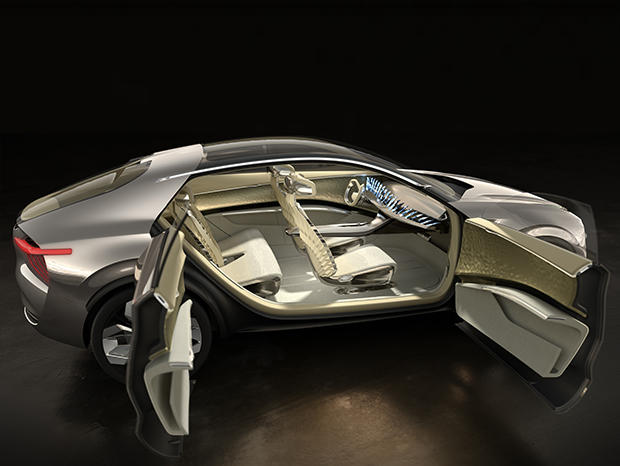 Presented in a lavish, futuristic chrome-grey, the concept creates an amalgamation of a sleek saloon style stirred with the many qualities of a crossover, all the while boasting an airy cabin space. The animalistic feel remains present with Kia’s classic tiger nose grille but on the Imagine, it comes outlined in LED lighting. 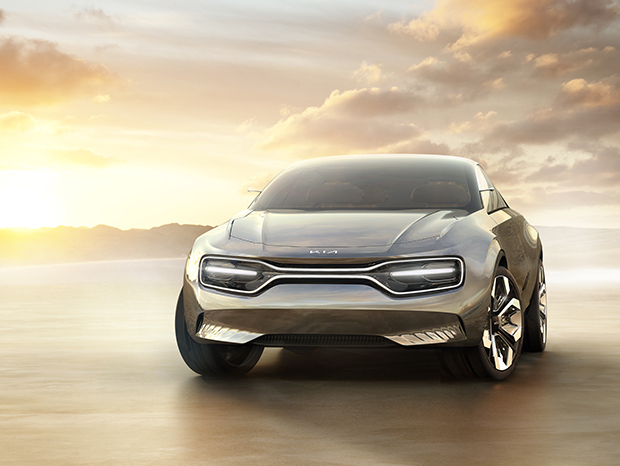 Exterior Creative Manager of Kia Motors Europe, Alex Daniel explains: “We tried to create a car that’s hard to categorise, not clearly a saloon or a hatch and certainly not a dry-looking electric vehicle either”. That’s right, this flash concept has been conceived to be powered by an all-electric powertrain reflecting Kia’s active move towards EVs in the future. Although not yet confirmed, there is speculation on a wireless charging system which could incentivise the use of electrical vehicles exponentially. That’s the number of ultra-high resolution, tablet-sized screens Kia has envisioned in place of a dashboard. The razor-thin screens strategically placed in a wave across the whole control panel will provide the car’s infotainment system. Though details remain minimal as to what features would actually be included, we can expect almost everything to be voice controlled and wireless technology based. Can you imagine? 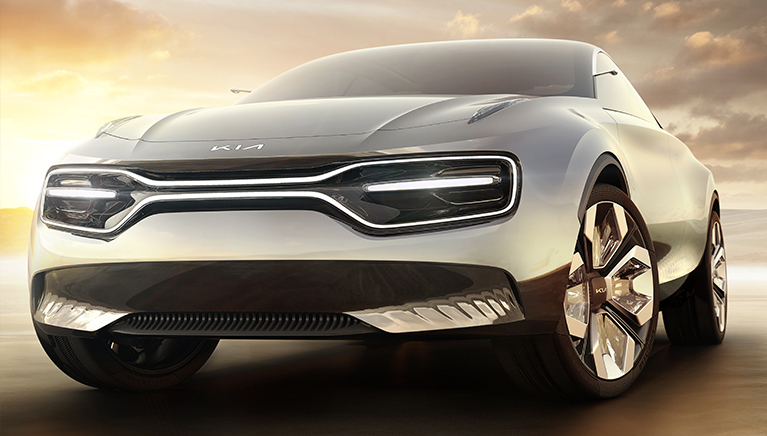 It goes without saying Kia’s concept entry this year is a sharp look into the future and a quick reminder of reality. Some say the 21 screens deliberately ridicule the sense of rivalry present in the industry when it comes to infotainment systems and which car comes with the biggest screen, after all, let’s not forget Tesla’s enormous 17” touch-screen on Model S. Similarly, Chinese manufacturer, Byton, has revealed its 48” wraparound dashboard screen earlier this year hoping to make it to production in the Byton M-Byte soon. 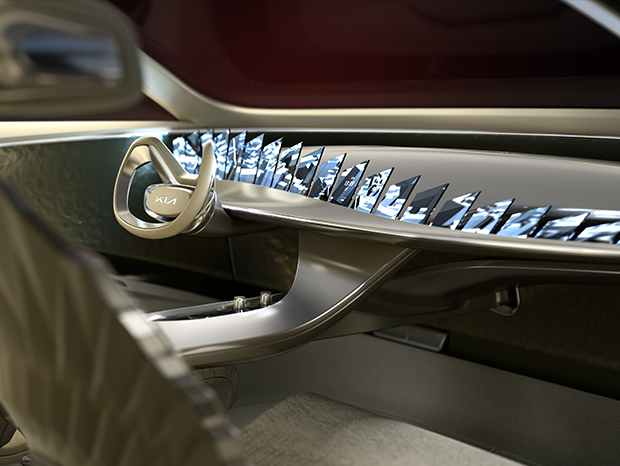 The concept attempts to deliver a ‘Shared Experience Display’ emphasising just how prominent a pulling-force towards infotainment-focussed vehicles proves to be in the industry today. Interior Designer, Ralph Kluge, emphasises the importance of the car being “more inviting than the normal rational approach” when it comes to the inside of the car. The quirky interior includes tortuously designed shell-shaped leather seats, but how would the Imagine do for performance? This would be the Korean brand’s first all-electric vehicle and Vice President of Design for Kia Motors Europe, Gregory Guillaume, emphasises the brand’s vision of answering “consumer concerns around range, performance, recharging networks and driving dynamism…” He goes on to say how Imagine was designed to give “you goose-bumps when you looked at it” and make “the hairs on the back of your neck stand up when you drove it”. Intricacies such as charging times, top speed and electrical range remain a secret but the curiosity to push boundaries amongst the team of designers is evident and there is no doubt we’d all like to see the concept car in action. It’s likely this specific model won’t make it to production like many other concepts but it would be a waste not to see some of the stimulating features on future Kia models. Could we expect a handleless Kia ProCeed in the near future? Or maybe the panoramic windshield-sunroof combo will make an appearance on the Kia Stinger? The thought alone get’s us excited but until we see it in the flesh, we can only imagine. Nissan brought a breath-taking entry to Geneva last week with their latest concept – IMQ. The SUV body comes sculpted with aggressive angular aesthetics in a silver-chrome futuristic paint job and the message is clear – the IMQ provides us with a sneak peek into what we can expect with the next-gen Qashqai. Whilst the top half of the concept reveals a sleek, aerodynamic silhouette, the bottom half provides a sense of rugged, unbeatable strength. Although the complexities of vehicle specifications are not available, the IMQ delivers promising things when it comes down to style and efficiency, for example, Range Extender technology. This is when a vehicle runs on a pure electric motor for all driving functions but also comes built with a smaller-sized petrol engine for the sole purpose of generating power and recharging the electrical battery. Range Extender technology is successfully practised in Japan’s automotive industry today and is set to enter the European sector in the next couple of years, maybe even in the next Qashqai! The interior feels even more futuristic. IMQ’s dashboard is effortlessly beautiful, eloquently sliced diagonally from the rest of the windshield area attesting to the designers’ great job of de-bulking elements that can usually become overwhelming in an SUV or crossover. The cabin space is expansive, despite the swooping roof proving looks can be positively deceiving! 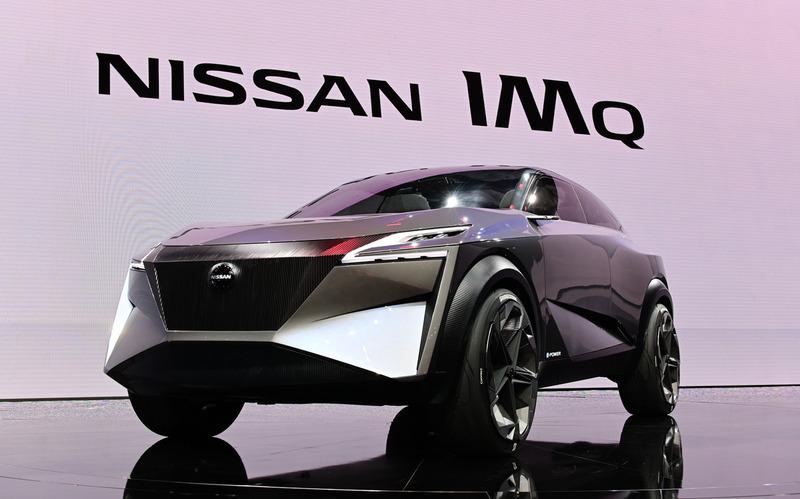 IMQ has undoubtedly signalled Nissan’s continuing approach into cleaner driving without the compromise of excitement. The concept’s new e-POWER powertrain is envisioned to push out 335bhp and come as All Wheel Drive, ideal for low-grip conditions. By allowing us to leap into the mind’s of Nissan innovators, the IMQ demonstrates Nissan’s desire to provide a human-centric driving performance without losing any of the trailblaze. On that note, who’s excited for the new Qashqai? Well there we have it, this year’s Geneva Motor Show proved to be an eye-opening experience for motor enthusiasts around the world and it goes without saying that Kia and Nissan peaked our interests slightly more than others. Let us know what your favourite entry was this year in our social media comments and we’ll be sure to reply!